The first issue of Manila Standard saw print exactly 32 years ago today. Over the years, the paper has reported on many events that in varying degrees helped shape the nation into its present state. It has seen the best and the worst of public officials, business leaders, and witnessed the impact of their decisions on ordinary people. As a company, the Standard has seen several changes in ownership, and consequently comings and goings among its leaders. It has tried some approaches in focus, format and style. What has remained over the years is its people's commitment and dedication to their jobs. 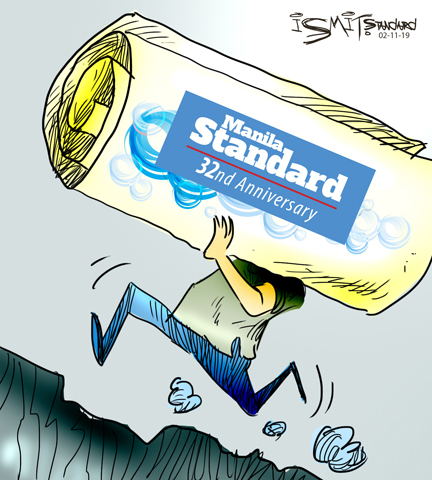 Many of Manila Standard's employees, across various levels in the organization, have been with the paper for years. They stay on amid the various threats faced by the media industry in general, and the challenges to the organization in particular. The age of fake news, the 24/7 news cycle and constantly evolving digital trends all pose various challenges to media, more so those that started as print. Likewise, heightened competition, conflicting interests and ethical dilemmas as well as practical gut issues and day-to-day housekeeping all serve to show that working for a broadsheet is not the first career choice for someone who seeks a job that offers moral clarity, financial rewards or stability. But this is not just a job, and this is why many of the Standard's people remain despite the odds. Journalism is indeed a vocation, one that brings rewards that cannot be fully quantified. Manila Standard has come as far as it has because of those who are willing to go to work on weekends, holidays and even during natural disasters, always on the lookout for developments even at odd hours. It is made stronger by the camaraderie of its people who set aside personality differences to come up with a product every day, no matter what, who uphold the standards of journalism despite being pulled in all directions, who build lasting friendships that go beyond newsroom duty, who try to see the good amid difficulties and who continue to hope that better times are ahead.